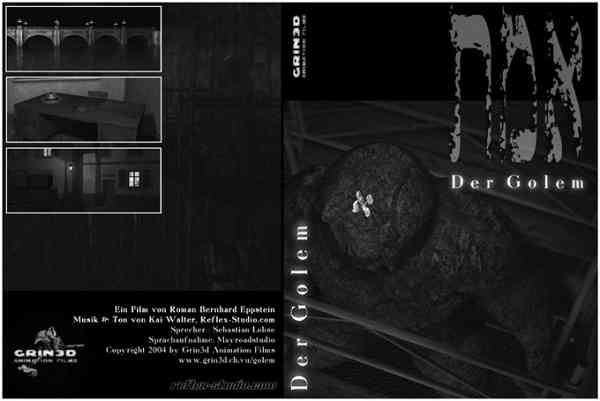 "The Golem" is my diploma-project for a one year's training course in "3D-Visualization and Animation" at [url=http://www.eb-zuerich.ch/]EB-Zurich[/url] (half a day per week, occupation-accompanying). Thanks to Rafi, Noé, Aldo, Marco and René. The Prague Golem legend told about Rabbi Jehuda Loew ben Bezalel (1512-1609), which formed allegedly a manlike creature out of loam. By prayers and a languagemagic ritual that was aroused Golem to the life. A nature without feelings, without free will, a robot-similar servant for the own protection, which revolted themselves however after some time against its creator, and its destruction work began, so that it was again transformed by its master. The Movie Trailer based on this legend and resumes the thread in the year 1930. The Legend becomes again alive. Voice Over is German spoken, you can read it here in [url=http://www.eppstein.ch/grin3d/golem/english.html]English[/url]. Any comments and critiques are welcome.